"The time spent with refugees was certainly the highlight of my internship at UNHCR and the opportunity to hear their stories was an invaluable learning experience." -Ariane Ménard (third from right), summer 2016 intern at the UNHCR in Quito, Ecuador. "This past summer was an incredible and practical experience interning in the human rights field, enriching my pursuit of studies in human rights and international law at McGill". -Shaké Sarkhanian (front row, third from right), summer 2016 intern, with Minister Bibeau and the entire team at the Permanent Mission of Canada to the United Nations in Geneva. "One of the highlights of my internship was my participation in two Taiwanese legislative assemblies, in which I represented Canada alongside diplomats from various other embassies". -Caroline Wesley (right), summer 2016 intern at the Canadian Trade Office in Taipei, alongside Deputy Director of General Relations, Charmaine Stanley (middle) and APNIC Board Director, Dr. Kenny Huang (left). "The professional experience I have gained by working at the Embassy allowed me to truly put my knowledge into action and to find out whether working for the government would be a good fit for me." -Sara Gold (middle), summer 2015 intern at the Embassy of Canada to Argentina, alongside Montreal Mayor Denis Coderre (third from right) and the Canadian Ambassador to Argentina, Robert Fry (second from left). 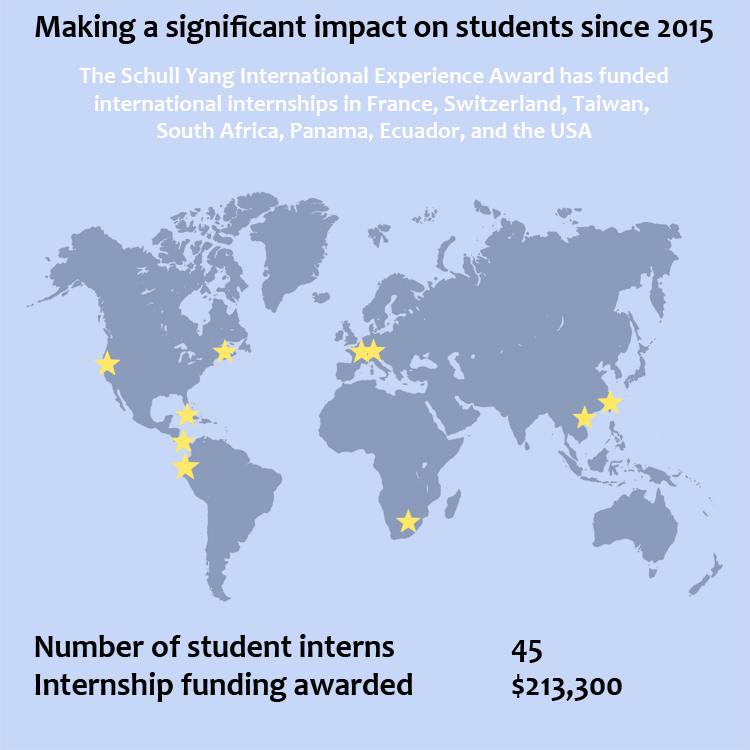 The Schull Yang International Experience Award, administered through the Internship Offices Network (ION), is open to students from all faculties who have successfully been selected for an ION international summer internship. These internship opportunities consist of partnerships selectively established by ION that enable students to garner experience in a government office, a large international organization, or a non-governmental organization. Award recipients are required to share their international experience with their peers upon return to McGill. To read more about how the experience shaped some of our program alumni, click here.